Kasstan J. R. ‘Signs of life in language death’, Guest Lecture, Centre for Linguistics, Language Education and Acquisition Research, University of Southampton (15th November 2018). Kasstan J. R. ‘On the sociolinguistics of language obsolescence’, Guest Lecture, Université de Lausanne (12th April 2018). Kasstan J. R. ‘Palatalisation de la latérale en position d'attaque complexe C+/l/: une variable sociolinguistique Labovienne?’, Entre Europe et Amérique du Nord : Regards Croisés sur le Francoprovençal, Centre d'études francoprovençales, Saint-Nicolas - Aosta (11th November 2017) [Press: La Stampa, La Vallée Notizie, Tradizioni, Corriere Canadese] [Video footage]. Kasstan J. R. ‘Back in style? Language revitalisation and emergent sociolinguistic norms among new speakers of Francoprovençal’, Anglia Ruskin and Cambridge Romance Linguistics Seminars, Anglia Ruskin University (19th October 2017). Kasstan J. R. ‘Variations et changements linguistiques dans les dialectes francoprovençaux des monts du Lyonnais’, Quelle place pour les patois en Suisse romande aujourd’hui ?, Université de Neuchâtel (21st-22nd September 2017) [Supplement]. Kasstan J. R. ‘Exploring standardisation and sociolinguistic authenticity among speakers of a contested language’, Multilingualism: Empowering Individuals, Transforming Societies Workshop, University of Nottingham (6-7th July 2017). Kasstan J. R. ‘New speakers as agents of sociolinguistic change: exploring evidence from obsolescent Francoprovençal’, University of Westminster (6th April 2016). Kasstan J. R. ‘The new speaker as agent of social and linguistic change: exploring evidence from obsolescent Francoprovençal’, School of Oriental and African Studies, University of London (19th January 2016). Kasstan, J. R. ‘Maintaining style in language death’, New Ways of Analyzing Variation (NWAV) 47, New York University (18th - 21st October 2018). Amos, J., Kasstan, J. R. & W. Johnson. ‘Reconsidering (t,d)-deletion as a single variable in English’, Annual Conference of the Linguistics Society of Great Britain (LAGB) 2018, University of Sheffield (11th - 14th September 2018). Kasstan J. R., Schifano, N., Sheehan, M. & A. Ledgeway. Linguistics in Modern Foreign Language A-Levels: Preliminary analysis of pilot data. Keynote to Theoretical Linguistics in Secondary Education workshop, 51st Annual Meeting of the Societas Linguistica Europaea, Tallinn University (29th August - 1st September 2018). Kasstan, J. R and U. Horesh. ‘Fresh insights on traditional variations methods in non-English contexts’, colloquium organised for Sociolinguistics Symposium 22, University of Auckland (22nd - 30th June 2018). Kasstan, J. R. ‘Back in style? Language revitalisation efforts and new sociolinguistic norms in Francoprovençal’, Sociolinguistics Symposium 22, University of Auckland (22nd - 30th June 2018). Kasstan, J. R. ‘Models and methods for exploring sociolinguistic variation and new speaker identities’, Sociolinguistics Symposium 22, University of Auckland (22nd - 30th June 2018). Amos, J. Kasstan, J R. and W. Johnson. ‘New perspectives on T/D deletion’, Poster presented at UK Language Variation and Change (UKLVC) 11, University of Cardiff (29th-31st August 2017) [Handout]. Karatsareas, P. and Kasstan J. R. ‘New historical perspectives on non-dominant speakers as agents of contact-induced language change’, workshop organised for International Conference on Historical Linguistics (ICHL) 23, University of Texas, San Antonio (31st July-4th August 2017). Kasstan J. R. ‘On new speakers and diversifying variationist sociolinguistics’, Approaches to Migration, Language and Identity, Université de Lausanne (4th-6th May 2017). Kasstan J. R. ‘New speakers as agents of change: evidence from Francoprovençal’, Borderlands Linguistics Conference, University of Bristol (27th-28th June 2016). Kasstan J. R. and Auer, A. ‘Exploring attitude and prestige in the ‘heritage language’ context: a cross-linguistic perspective’, colloquium organised for Sociolinguistics Symposium 21, Universidad de Murcia (15th-18th June 2016). Sallabank, J. and Kasstan, J. R. ‘Deficit and new values in the linguistic market for small languages’, COST New Speakers Whole Action Conference, Universität Hamburg (12th-14th May 2016). 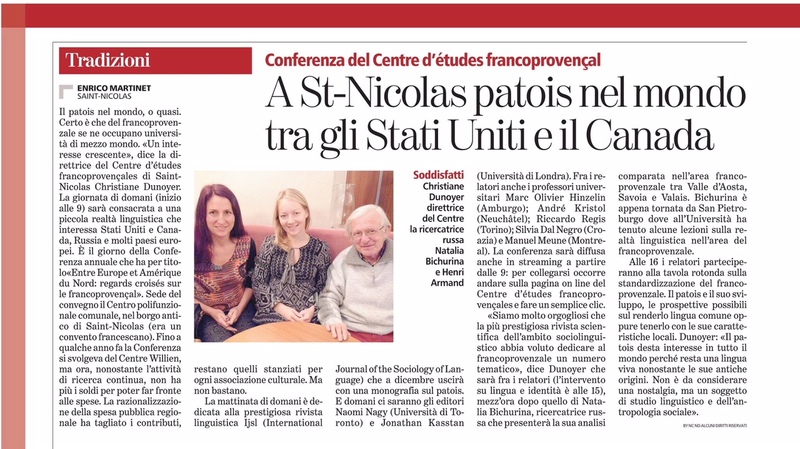 Kasstan J. R. ‘New speakers as agents of social and linguistic change in Francoprovençal-speaking communities’, New Ways of Analyzing Variation (NWAV) 44, University of Toronto (22nd-25th October 2015). Kasstan J. R. ‘Convergence and divergence in Francoprovençal: new speaker networks as sources of linguistic innovation in obsolescent dialect communities’, panel on ‘Minority languages in Europe’, International Conference on Language Variation in Europe (ICLaVE) 8, Universität Leipzig (27th-29th May 2015). Kasstan J. R. and Woolhiser, C. ‘The native/non-native dichotomy and questions of language ownership: findings from studies on new speakers of Francoprovençal and Belarusian’, Sociolinguistics Symposium 20, University of Jyväskylä (15th-18th June 2014). Kasstan, J. R. ‘A social network approach to variation in obsolescent Francoprovençal’, UK Language Variation and Change 9, University of Sheffield (September 2013). Kasstan, J. R. ‘Towards a pan-regional orthography for obsolescent Francoprovençal’, Language Endangerment III: Language Policy and Planning, University of Cambridge (July 2013). Kasstan, J. R. ‘Standardisation through the back door? 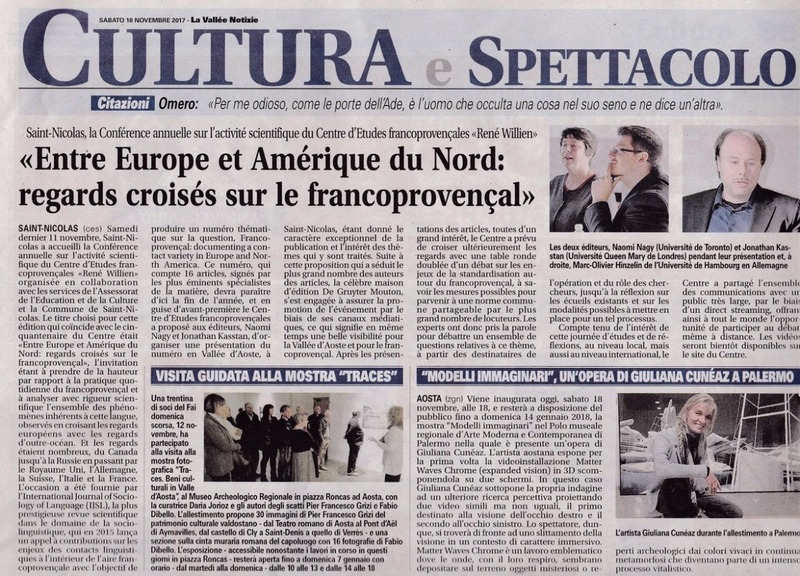 Neo-speakers and “distanciation strategies” in Francoprovençal’, Association for French Language Studies, Université de Perpignan (June 2013). Kasstan, J. R. ‘Towards reconciling a pan-regional identity for Francoprovençal speakers’, I-MEAN 3: Identity and Language Conference, University of the West of England (April 2013). Kasstan, J. R. ‘Emerging néo-speakers: implications for regional varieties and language shift’, Regional Varieties, Language shift and Linguistic Identities, University of Aston (September 2012). Kasstan, J. R. ‘The changing representation and denomination of France's regional varieties: a case study of Francoprovençal’, Association for French Language Studies, University of Newcastle (June 2012). Kasstan, J. R. ‘Francoprovençal: challenging traditional models of obsolescence’, 6en Obrador de Lingüistica Occitana, Université de Toulouse 2 (March 2012).